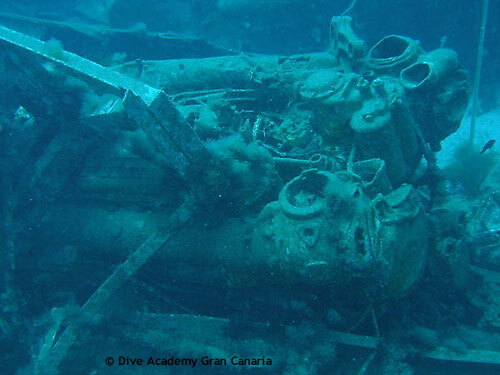 The Russian Wreck El Pajar is a hydrofoil boat of thirty meters long ripped open because of a heavy storm years ago. The wreck of the Meteor or El Pajar is a hydrofoil boat from Russian origin that sank in the year 2003. It's approximately 30 meters long and 9 meters wide and sits at a depth of 17 meters. The wreck was sitting up-right and mainly intact for a couple of years but a heavy storm abused the construction so much that it is wide open now. This makes it even more interesting because now you can actually see a lot of details and components that are often hidden inside. For example the big jet-engines are completely in the open now! Another challenge is to take a seat in one of the many passenger seats still present. What a photo opportunity! Over the years the wreck became the home of a lot of fish, so there is an abundance of life and big barracudas often circle the wreck looking for a snack. El Pajar is the wreck of a Russian hydrofoil ferry which sank in 2003. She sits upright at a depth of 18m and is a length of 30m. The wreck can be penetrated at a number of places including through the large panoramic windows. The interior is still intact and you can see the seating, toilet area, bridge and engine room. Without fail you will see large shoals of fish and a large number of big Sting Rays under the hull of the ship.